Welcome to Day 3 of the 12 Days of Holiday Inspiration Blog Event brought to you by "The Inspiration Crew". We’re just a group of online crafty blog friends who love being creative. This time we're doing a 12-day event to provide you with tons of Holiday Inspiration. 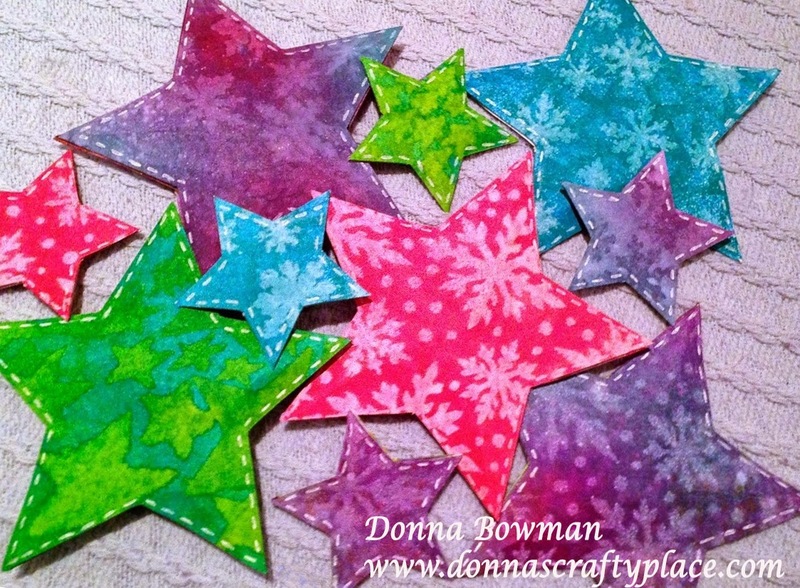 Today, I'm sharing some stars made using art journal pages I made with Dylusions Christmas Stencils and spray inks. The star die is from Tim Holtz. To finish off the stars I added some white lines around the edges with a white gel pen. You can use them to decorate cards, or put a hole in them and add some twine to make ornaments, string them for a festive banner, or just pile them up in bowl for a pretty Christmas decoration. I love how bright, fun and festive these stars are. Thanks for stopping by and be sure to stop back by tomorrow for Day 4! Love the stars - such vibrant colors. Gorgeous colours - I love this idea! I love the colors you used for the stars!! Oooh, I love these stars! I would make a batch of them just to have on hand! stars, fun to look at! Very fun and festive colors!